Captain Sir William Peel V.C. K.C.B. was one of the most remarkable men ever to serve in the Navy. He actually won his Victoria Cross three times over, in three separate acts of gallantry during the Crimea War. But for his untimely death at the age of thirty-three, he would have reached the highest ranks in the Service. So what do we know about him? William Peel was born on 2nd November 1824 at Great Stanhope Street, Mayfair. The fourth child and third son of Prime Minister Sir Robert Peel and Julia Peel, youngest daughter of Sir John Floyd. According to his father, William decided to join the Navy at the age of three. 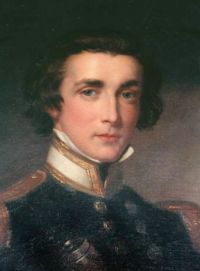 He went to the Reverend Mr Faithfull's school at Hatfield and then to Harrow 1837 to 1838 before joining the Navy as a Volunteer First Class on 7th April 1838. 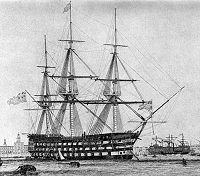 His first ship was the line of battle ship Princess Charlotte 104, flagship of Admiral Sir Robert Stopford in the Mediterranean, and he served in her during the Syrian War at the capture of Acre in November 1840. (When he returned he brought home three orange trees for his mother, who was a keen gardener.) This is where he was awarded his first medal, the Naval General Service Medal with the clasp Syria. The Naval General Service Medal (NGS) obverse with the young Queens head on it by William Wyon is shown below. The reverse shows Britannia with a trident mounted on a horse. The riband is white with dark blue edges. This medal covered the period 1793 to 1840, a total of 231 bars were sanctioned and the medal was never issued without a bar. The one on William Peels medal was that for Syria. At this time he was a midshipman on the Flagship of Admiral Stopford, the Princess Charlotte. 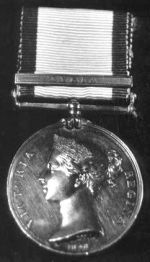 The picture shows the naming on the medal, it is intended, that only the recipients name appears on the rim of the medal, not his rank or the name of his ship, at sometime Peel had his rank of midshipman engraved on the medal. Peel at this time was 16 years of age. You may think that this is quite young, however you will be interested to know that as this medal was not sanctioned until 1848 some 55 years after the first action it was to be awarded for. During the battle of the Glorious 1st of June 1794 a son was born to Mrs McKenzie, who was on board HMS Tremendous, and he received the names of Daniel Tremendous and was duly awarded his medal and bar, as applications for the medal were not made until 1848, it must surely be unique for a man to apply fifty-four years later for a medal awarded for a battle fought on the day he was born. In these days, when we hear so much about the youthful age at which men go to war we would do well to remember Daniel Tremendous McKenzie! Another interesting expression I was reminded of recently was the expression "son of a gun". This came about from when ladies such as Mrs McKenzie were in transit on His Majesty's ships, and were to give birth, the only place available was to have a part of the gun deck between two cannons, screened off, for the birth to take place, hence the expression:- "son of a gun". The reason for the action in Syria is that in 1840, Mehemit Ali, Viceroy of Egypt broke his agreement to leave Syria alone and invaded it. As Britain, Austria, Russia and Prussia had guaranteed to act in the event of any trouble, a combined fleet under Admiral Stopford, was sent to evict him. Acre was bombarded and captured on 3rd November. He was also awarded the St. Jean D'Acre medal in silver for this action. Shown here are the obverse which shows the Turkish flag flying over the Fortress of Acre, six stars and the Arabic for The country of Syria and the Fortress of Acre, 1256, AH. The reverse is the Sultans cipher within a laurel wreath. 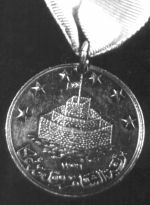 This medal was presented in gold to Naval Captains and Field Officers and above, in silver to all other officers and warrant officers, and bronze to seamen, marines and soldiers. It was awarded to all who received the NGS with the bar for Syria. The ribbon is pink with white edges. These photographs incidentally are of the actual medals and Orders of William Peel. Towards the end of 1998 I went on a trip to visit the National Maritime Museum and during the trip we picked up a passenger in London en-route to Greenwich. This turned out to be the great-great-great nephew of William and he had with him Peels Orders and decorations. I asked him if I could have a loan of them for a forthcoming talk by a member of the Birmingham Medal Society on the Naval Brigades, he agreed. So for about two months I was privileged to have in my possession Peels awards unfortunately I then had to hand them back to him!